Necessity for a bicycle navigator finally formed after the third brevet of 200 km. Despite the usual preparation: a map-case with printed map, reworked legend – I drove the wrong way three times. The most unpleasant thing in this case – the feelings when you have realised that got lost. It becomes meaningless to pedal as it likely it will be need to return back. But do not pedalling – also pointless. 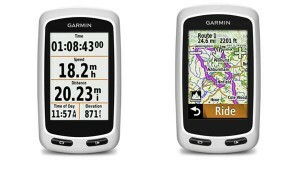 Exactly at that time Garmin has released a “naked” Navigator for cycling. Before that, “Edge” series meant cycling computer with a possibility of navigation. I’m not fun of “all-in-one” devices, besides the price of “only navigator” was much less. 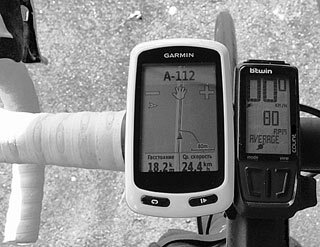 Study of Garmin device was not taken easily, to read manual was not enough. I had to shovel a decent volume of information from forums. The result is a sequence of actions, which I want to share. I must say that in general I quite satisfied with Garmin. 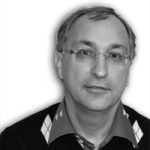 Apart from the fact that I no longer wandered in brevets, I received two new features: you can develop in advance a route through unfamiliar terrain and you can find intricate trails in the woods (“Cross Country”) for advance training before competition. I am using OSM (Open Street Map). It – free maps. Once a season I download the latest “build” from resource MapTourist.org (in Russian). 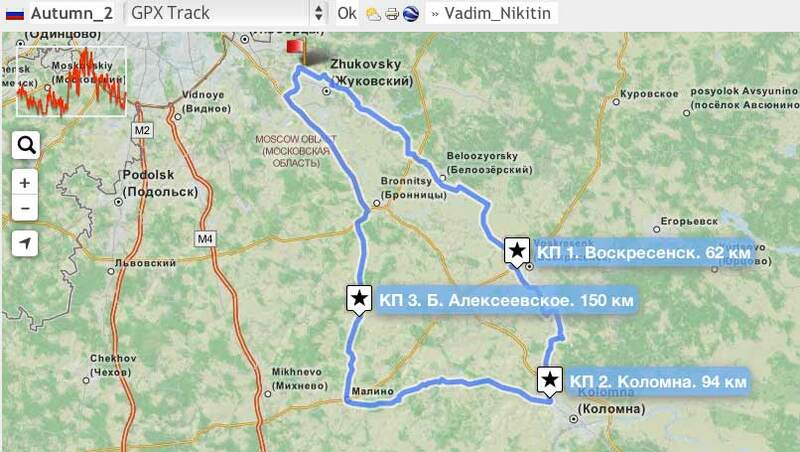 Map of Russia and the CIS is updated every day, at the page “Files \ Navigation \ Garmin”, reference. It is necessary to download the file “gmapsupp.zip”. Then you need to take out the garmin flash card (SD card), insert it into a computer via an adapter and write unzipped file into the folder “Garmin”. If the flash drive already has other map with the same name, then other map must be renamed – after the name of the file need to append “1”. In Finland and Austria we used the “Open Cycle Map”of Europe, which was included to the package of garmin on a separate flash card. These map – also free. I design track with the resource GPSies.com. There will need to open an account and then design and store own tracks, as well use other tracks as a basis for editing. For me it is much easier to work with GPSies than with the program BaseCamp from Garmin. For design of a new track just put the first point after the start, it appears line between of these two white points, put cursor over any of them, then red dot appear between white dots, dragging it where you want, etc. White dots could be moved. You can turn on mode when track between points will automatically snap to the road, but I get faster to do it from point to point. If you want to delete points (or part of another track while editing), then allocate them within rectangular area and after it deleted, the remaining points be connected by a straight line. Then save track on the site and make export GPX file to your computer. 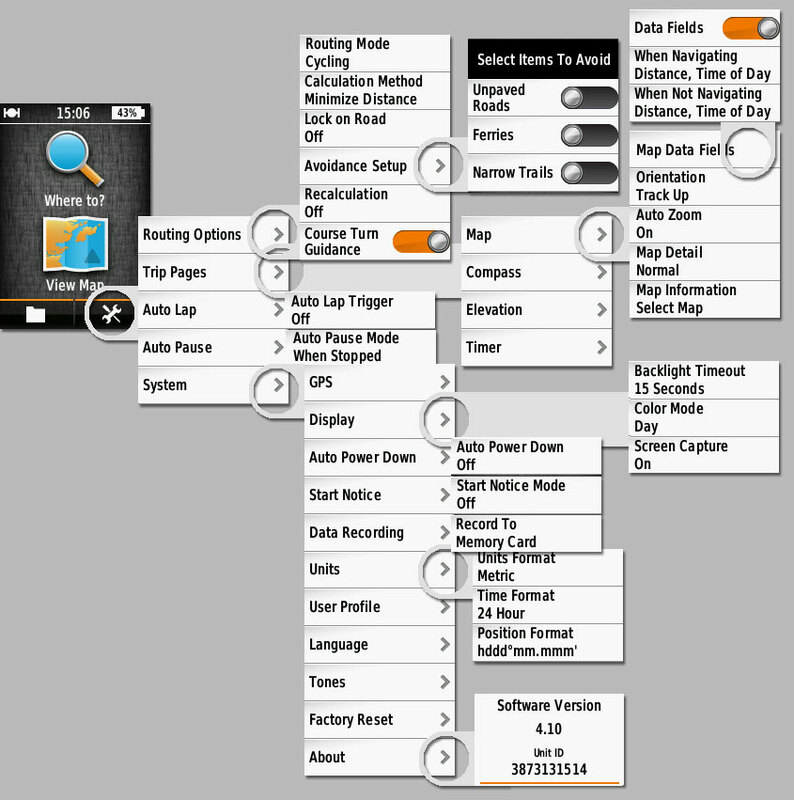 Then connect Garmin or SD card from it to a computer and copy the GPX file to the folder “NewFiles”. When you turn on Garmin next time, file “GPX” will disappear forever from this folder, and Garmin make according file “FIT” and write it to their folders. Settings, start, keeping on track. Before start after switch on you need to choose “where to?” – “Saved \ Courses” – and select desired course. Then – 2 variants are possible. 1. 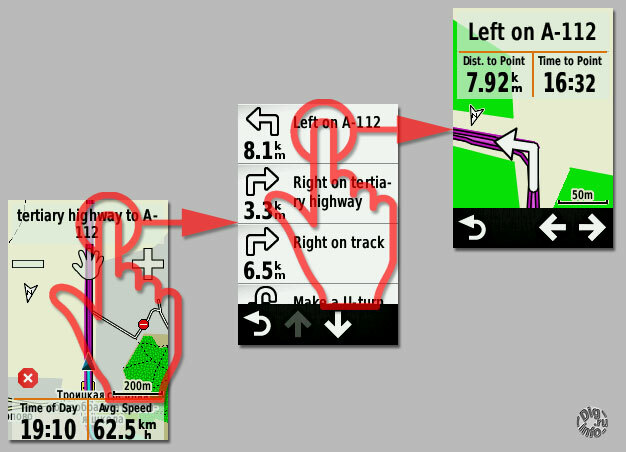 Garmin just shows a map, on it – the course (blue), current position (cursor) and the recording track (light blue). All this – in a convenient size of map. Oddly enough, this option I was looking for a 1.5 year and found due to an unexpected hint from forum. To do this in the menu that appears after the steps above, need to select the “Map”. Of course I lot of times went to this mode, but just to check how well the route loaded, as the route is displayed in its entirety. But if you press the right button of the device to start recording a track, the map goes into convenient for driving size. Moreover, you can just start moving, Garmin identify it and recall that is not harmful to press the right button. 2. Garmin leads along the track. It seems – this is the main mode because it starts by pressing the “Ride”. Garmin will spend some time on the superimposition track on a map and layout of intersections and then give a signal of readiness. When driving Garmin acts exactly as a navigator: warns before turns, shows intersections at close-up view and berates (beeps) if you go the wrong way. At home before the trip can be viewed as a Garmin put turns on the route. There is emulation mode of passing the route. 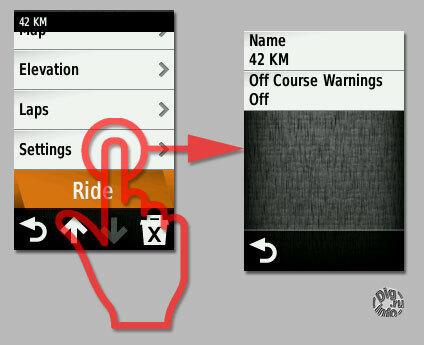 To do this, switch the GPS on “demo mode” (Settings/System/GPS/GPS mode/ Demo mode). Next, load the route as usual and start. Garmin lead along the route at a speed of 70 km/h. To view the maneuvers at intersections need to tap on the top line, which is the name of the road. 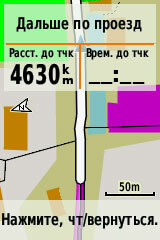 A list of intersections will be shown, if to tap on any of them, revealed a close-up view of intersection. This of course can be done in real motion. Unfortunately, there are inconveniences also. Garmin try to optimize the route, and do it somehow in his own way. This route is shown by the thick purple line while the original track – a thin purple line. Therefore, if they match, the thin line is lost and, if not the same, two lines are drawn. So “with experienced eye” one can discern two lines. But Garmin consider that only “fat” line – is correct, so if the strong mismatch – he berate. You need push on the screen to stop beeping, but it often get me nervous. The most bad, that if Garmin decided that you did not passed through some important (for him) point, he tries to force you make turn back at each intersection and do it approximately 20 km. In general, I try to treat it with gentleness, as he shows the original track, and navigate good. In principle, it is possible and even desirable to prohibit re-routeing, then Garmin just fix the deviation, but will not ask to turn back. But there is a difficulty. The firmware 2.60, which I’ve used in seasons 2014-2015, and almost the entire season in 2016, prohibit of re-routing should be done in two places, in main route guidance menu (see. In the settings below) and in particular loaded route. Charge of battery is enough for brevets of 200 km (8-10 hours). On the 300 km brevet I took an external battery. It turned out that in this case Garmin stops to control the backlight, it switched on all the time. I could not figured out what to do. This year released a significant update of firmware. There was version 2.90 before and became 4.10. I’ve updated and had to tune the settings again. Probably easier to tune the piano :). Prepared picture with the settings in order to spend less time next time. This is setting for ride along track. In my opinion in the firmware 4.10 is better implemented autoscaling. And navigation along track become different, now intersections appear much in advance if there are no turns before. Apparently this is done to save battery power, for less redraw the map. 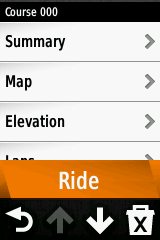 Yes, and 4.10 keep ride on track more accurately, before it garmin try to cut the distance, despite the prohibitions. Unfortunately, not without bugs. After loading the distance now it is strictly necessary to check how it looks on the map. 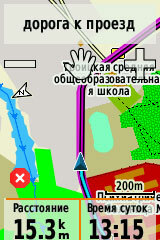 And if instead of map is white screen, which only indicated the strange scale around 800 km in cm, this is bug №1. It is necessary to go back and repeat tap the map view. For the second time the map is displayed in the correct scale. The bug №2 is that sometimes appears big view of phantom intersection few (thousand) kilometers aside. And it not removed because it not even come close during the ride (sometimes approaching first, then moving away again, because this is phantom). Of course in the end you have to tap on the screen to return to the map. At this point the navigation usually ends. That is further shown a map, track, but no more the tips where to turn. The reasons for this may be a few, but I “drove” two routes in the same locality, one of which works perfectly, and the second stable fails. So I think the case is in the firmware. Just in case I’ve digged the Internet, how to get back to the previous firmware. Unfortunately at first view, for Garmin Edge, correct to assume that no way back. There are some dangerous “dancing with a tambourine” with program “Garmin Firmware Patcher”, but I’m afraid device can turn into a white brick. However, after several attempts to fight at a distance with bug №2 on different maps with different settings I’ve found how to safely return to the firmware 2.60. Bigs №1 and №2 were gone, so I considerfirmware 2.60 as quite workable. 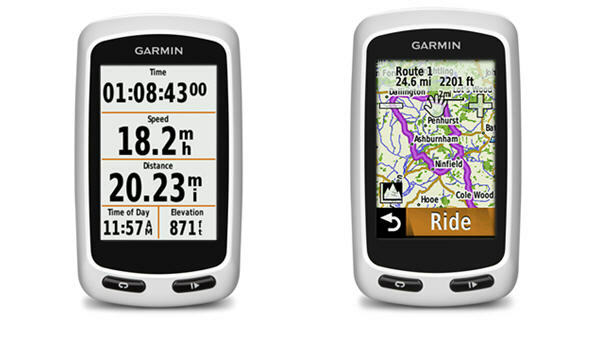 More about this in a separate note: Garmin Edge Touring downgrade firmware.